As an organization serving over 800,000 residents, Edmonton Fire Rescue Services (EFRS) has countless opportunities for you to join us in our mission to protect life, property and the environment. 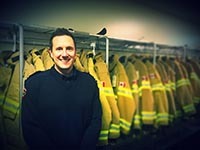 Edmonton Emergency Services is an industry leading provider in the area of Fire Rescue Services and Dispatch Services. Edmonton is clean, safe, family-oriented city; you and your family can feel secure and excited about your new career with Edmonton Emergency Services. Part of the City of Edmonton, EFRS is 1 of only 7 internationally accredited fire departments in Canada. We strive to be an employer of choice and our goal is to attract the best-qualified candidates for our employment opportunities. Our world-class services include fire suppression, technical rescues, and responses to life-threatening medical situations. In addition to frontline operations, we also engage citizens with fire prevention programs and public education initiatives. Our fire personnel are on call 24 hours a day, 7 days a week to respond to emergencies. With one of the best training programs in the country, we ensure our personnel are equipped with the skills they need to succeed throughout their careers. Join our team as a firefighter or fire prevention officer and help make Edmonton one of Canada's most livable and safe cities! It's been such a rewarding experience. Every day, you see passion to do our jobs the best we can, and compassion for every individual we help. It is bittersweet to retire after 39 years from a career I have loved so much, but I’m happy that I chose EFRS as a career. I honestly think I was predestined to become a firefighter. As a kid, I played on fire trucks and the career aligned with my personal values. I’ve had a diverse range of opportunities in my career, including experiences in wildland firefighting and in Hazmat, and in each position, I feel the satisfaction of working with my firefighting family to help people. Now, my current role allows me to inspire youth towards a career that I hold with the utmost regard. I joined EFRS because being part of a team, learning, as well as helping people, often on their worst day, appealed to me. In eight years, I’ve seen some really sad and scary calls, but I’ve also had calls where I witness unbelievable kindness, happiness and support. To me, the pride, the empowerment and most importantly, the feeling of belonging to a team that will never let you down is something very few professions will ever know.